I was privileged to attend Labour’s Annual Conference in Liverpool as a voting delegate. The Conference was the book-end of a summer in which the Labour Party re-opened the debates about programme and strategy which many had thought finished last year. This article reports my experience and views; it is quite long, about 2750 words and is broken up into sections, Unity and the membership, some comments on the politics of Conference, a short section on the future, also covering the Tuesday atmosphere and Wednesday’s Leader’s speech. This is followed by a commentary on the Rules debate and the surrounding shenanigans; the main part of this article/report is concluded with comments on the state of the debate on Immigration and Brexit. The article then looks at my contributions on the Regulation of Powers Bill on the Fringe and in a Policy Seminar, mentions Emily Thornbury’s defence of Shami Chakrabarthi and conclude with comments on e-voting at Conference. The article is finished with a list of the description of the rule changes passed. On taking advice I considered it too long to present to the General Committee that sent me and so I have posted it here. Earlier in the summer, the Momentum backed slate of NEC candidates had won all six positions in the CLP section of the NEC, suggesting that despite the imposition of a “freeze date” and the over-enthusiastic, and in some cases malevolent purging of the membership list and electoral roll that the membership were likely to confirm the decision they took last year. 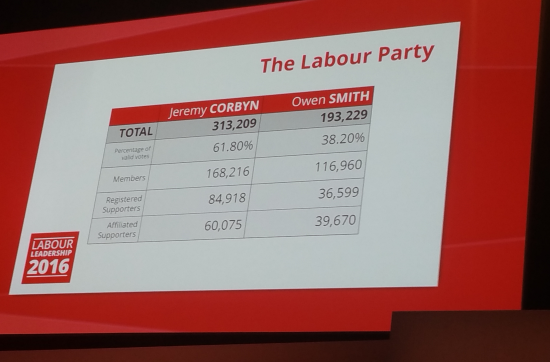 On Saturday morning, I attended the Special Conference to hear the results announced and as we now know, Jeremy Corbyn won the leadership with a larger mandate despite the purge. The reaction of the outgoing NEC, in a decision taken the day before Conference opened, had been to propose that the NEC be expanded to include nominees of the Scottish and Welsh Party Leaders as part of a series of devolution measures. The result of this amendment was to tip the balance of the NEC against Corbyn and the membership. The NEC used to consist of 33 members, of whom only six are elected by the membership, there are now 35 members of the NEC but over ½ million individual members. One would think that now would be the time to unite to send a single message to the British electorate, but from their leaflets and speeches, the so-called Moderates clearly do not accept the membership’s decision. The following day, Paddy Lillis (USDAW and outgoing NEC Chair) and Ian McNicol (General Secretary) gave uncompromising speeches suggesting that it was for the membership to express unity with the PLP. McNicol also stated that he stood in solidarity with the hard working staff (of the Compliance Unit) who had suffered from unfair and harsh criticism for running the purge. He has no right to that, he is not a member of staff, he is an officer of the Party and they were doing what he told them. This one sided and misplaced definition of unity was repeated by Tom Watson in his speech on Wednesday. The NEC are having an “away Day” which they call Democracy day; it is expected that a number of changes, especially around policy making but probably also around PLP/Membership relationships will be discussed. Tuesday was rules day and finished with Tom Watson’s speech. 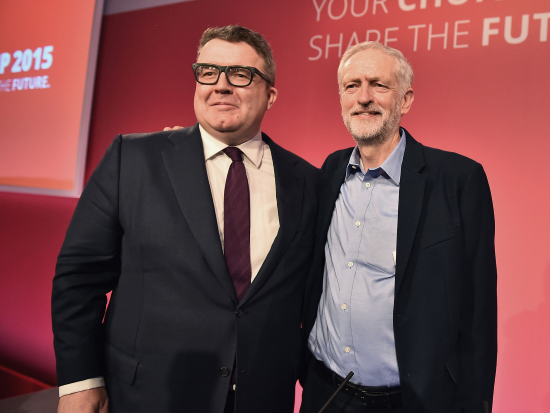 The atmosphere on Tuesday was dreadful, Tom Watson’s speech was both cheered and heckled. It was not a call to unity. Although I believe we need to make ourselves happy with our history. (Not all of it obviously, I tend towards a first term/second term view and Watson needs to put his hand up to his role in the (two) coups that replaced Blair with Brown in the third term.) While some have accused Momentum of being a party within a party, my fear is that we now have two parties within the Party and there remains little room to be a centrist, as frankly, Owen Smith discovered and Ann Black may yet do. This is going to be even more difficult to fix while large parts of the moderates won’t debate policy because to them it’s not about the politics, it’s the person. A number of the rump New Labour MPs and delegates left on Tuesday night and thus missed Jeremey’s leader’s speech. Other visitors were allowed into the hall, members who have paid their own money to see Labour’s democracy in action. They were (nearly) all Jeremy supporters, if they get involved and stand for branch and CLP office and as delegates, next year’s Conference might be very different. Women’s Conference is to have a formal policy making role. Councillors voting against legal budgets proposed by labour administrations may be disciplined, this stupidly entrenches Tory law in our rule book. Additionally, one amendment from a CLP was passed, that the National Policy Forum report to conference can now be voted on in parts. This is good, but we need to ensure it’s published in time to allow discussion and mandates and obviously depends upon the Policy making process continuing to include the NPF and its report. You may have read about the shenanigans that took place around the Conference Arrangements Committee’s & NEC’s decision to vote their proposed changes though as a single rule change. No notice to the party has been given; CLP amendments need to wait for 12 months. I for one would have preferred a mandate. Calls for a card vote on the issue were ignored by the chair, Peter Lillis again. At least three of these calls were made from the speaker’s rostrum, and one by a member of the NEC. Non-voting attendees are present in the delegate hall; no measures were taken to identify them and ensure they didn’t vote. There is a list describing the all the NEC rule changes at the end of the article. We have a new code word, it’s called listening. A bunch of northern MPs are arguing we need to listen to the ‘OUTERS’. They ignore the fact that Labour’s majority was to remain, and probably support a ‘free movement of people’ and not labour. We now seem to have a majority in the PLP that think we should craft our programme and offer to people that don’t support us, in opposition to the views of those that do. (Well, we’ve been doing it since ’95). We do it seems have cross factional unity in arguing that Free Movement is over, since both Tom Watson and John McDonnell have proposed this. If after, empowering trade unions, setting a minimum wage, creating new industries and jobs, introducing tax equity, building more houses, controlling rents, building and running more great schools, abolishing student tuition fees, re-establishing the EMA, reinvesting in skills training, abolishing zero hours contracts, mandating local vacancy advertising, creating a migration stabilisation fund, we find that people still want to ‘Control Immigration”, what do we do next? This is a genuine question, I can’t see how to triangulate, accommodate any further. I should add that I don’t believe Immigration can be controlled, other than through GDP deflation and the whole debate ignores, or sublimates the issues around overseas students and academics and refugees, where pursuing these policies means Britain is damaging its wealth creation and global soft power and also letting itself down by offering a shocking moral leadership. A second part of this argument is that those arguing that we’ll lose the ‘left behind’ if we don’t listen to their ‘concerns’ on immigration believe that arguing for a second referendum even once we know the exit terms, negotiated in good faith by those that broke it, will lose us those elements of the working class that are flirting with UKIP. I am not sure we ever had them but I believe that once the terms are known, the referendum’s mandate should be retested, more a question of, “Is this what you want?”, rather than an instruction to think again. Owen Smith allowed himself to be smeared as an elitist that just wanted to reverse the referendum result; he hasn’t done those of us who wish to remain in the EU any favours by losing that argument. Despite this, Conference voted for a 2nd referendum and that one of Labour’s demands is the protection of all rights for EU citizens living in the UK, and expatriate Brits living in Europe; the NEC response to this has been disappointing, Conference sovereignty is it seems, optional. These issues are a serious split. As an English Party we have no unity over the issue, I hope and believe we do in both London & Deptford. We should have noted that the subject title was Grammar Schools and not Education but we were badly stitched up in the composite meeting. The front bench wanted a motion exclusively on opposing Grammar Schools and our words on academies and governance were considered a distraction. Angela Rayner (Shadow Secretary of State for Education) said that she felt that having a broader motion would make it harder to win Tory MPs into stating their opinions in the House. There’s a reason selection was abolished; it creates more losers than winners and some Tories know this or remember. Rayner clearly believes this can be won in the House of Commons. The majority of the meeting, including an organisation that had submitted the same words voted to accept the proposed Composite; we got five words into the motion, including Conference & do. This unfortunately clearly represented the view of the meeting. The chairing was fair in terms of the use of time, but he took a vote on the substantive without taking votes on the amendments, and then refused to allow us to vote against the substantive; one of these “all those in favour? All out!” types of ballot. As a delegate I found it harder to get to the fringe events than I’d hoped and found it and the exhibition weaker than in previous years when I attended. I did get to the Liberty fringe meeting where I asked the panel why Labour had abstained on the Regulation of Powers Bill/Act, there was a mixed response, ranging from we need lawful regulation and the evidence (Emily Thornbury) via the new powers are troubling (Chukka Umunna) to hints of unacceptability from Richard Burgeon. It worries me that they are all lawyers and I have come to the conclusion that the previous Labour front bench spokesman (Kier Starmer) is too close, as in too knowledgeable, to the police and the prosecutors. I raised the issue again at the Conference Home Affairs Policy Seminar, where I recognised that Labour has removed “economic security” from the list of grounds for spying on people, but that the authorising of “bulk powers” and the desire of the intelligence services to find bad people by comparing them with good people and the need to trawl all the UK’s Internet traffic is and will create a chilling effect and negate any promise on not spying on Trade Unions. I also made the point the Labour Party’s bureaucracy’s similar trawling of people’s social media spores also creates a chilling effect, there are people in the Party that are avoiding social media other than with friend and family; I was asked about the new phone app, “My Labour” as to whether it was a surveillance tool, and have certainly advised new members to put something factionally neutral on the application to join forms. The Labour Party should be at the centre of civil liberties defence and our recent experiences in the party should make us more cautious not less. I also enjoyed Emily Thornbury’s robust defence of Shami Chakrabarti, against those who through their words, silence or acquiescence to the attacks on her integrity are doing the Party, civil liberties and decency a major disservice. It should be recognised that at least some of the attacks on Chakrabarti have been sexist. I just wish to finish the report by making a comment on the e-counting of the card votes. The card vote is split between the delegates representing the CLP. The delegates name and a bar-code is published on the front and each of the cards. The counting computer allocates the number of votes to the card. To know that your vote is accurate, you need to read the bar code database record, This cannot be inspected. I am unclear if the votes, other than the result are published. It’s this lack of transparency that led us to photograph our ballot papers and collectively witness the placing of the vote in the ballot box/tray. We do not know if the votes were counted accurately. This isn’t good enough. While I am at it, the rules are not available in text form, and as such cannot be mined; there is no software index and when you pass the rules through a pdf parser, one gets a list of images containing the rules. The Conference documents maybe equally inaccessible. The article SURL is http://wp.me/p7KCT7-17J. Image Credits : Liver building and results: Dave Levy CC 2016 BY-SA, Watson & Corbyn, copyright ownership is unclear, I have performed a search using Tineye. The exact words are included in CAC Report No. 3. The Leader and Deputy Leader do not need to seek nominations to be on the ballot paper in the case of a challenge petitioned recall election. Councillors voting against legal budgets proposed by Labour administrations may be disciplined, this entrenches Tory law in our rule book. Labour Group Executives must implement a gender balance, failure to do so will render them liable to disciplinary action. Small Labour Group members may pay their tithe in a single payment. New local trade union affiliation timing and AGM eligibility has been tidied up, but subject to a 60 day deadline. This is longer than any other deadline specified and 170% of the meeting notice period required. The coming establishment of “Combined Authority Mayors” is recognised; accountable to NEC, except presumably in Scotland & Wales, not borough or county parties.